1 of 3 Heat oven to 350 degrees . Heat oil in a large saucepan over medium heat. Add onion, pepper and celery. Cook, stirring, for 10 minutes. Add garlic; cook for 1 additional minute. Stir in quinoa, 1 1/2 tsp of the Cajun seasoning and 3/4 tsp of the salt; cook for 1 minute. 2 of 3 Stir in broth and 1 3/4 cups water. Bring to a boil over high heat; boil for 2 minutes. Remove from heat and carefully ladle into a 2 qt baking dish. Cover tightly with foil and bake at 350 degrees for 25 minutes. 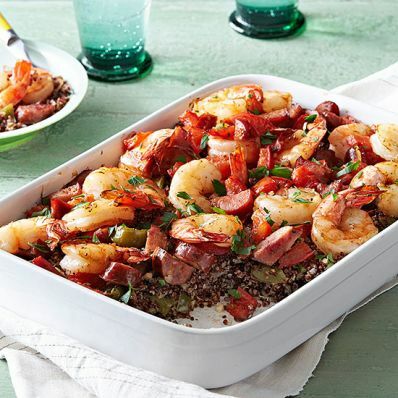 3 of 3 In a large bowl, toss together shrimp, sausage, tomatoes, parsley, remaining 1/2 tsp Cajun seasoning and remaining 1/4 tsp salt. Carefully remove baking dish from oven and uncover. Spoon shrimp mixture over the top, re-cover and return to oven. Bake at 350 degrees for an additional 20 minutes. Let stand for 5 minutes before serving.